Metrobank Foundation presents activities celebrating art and creativity as part of its MADE Art Exploration Series '09. MADE or Metrobank Art & Design Excellence program is celebrating creativity on its 25th year this year. On September 19, 2009 (Saturday), a panel discussion entitled "The Importance of Collaboration, Competitions and Awards" will be held at Le Pavillon at Metrobank Avenue, Metroplitan Park in Pasay City at 3-5pm. The Panelists are Benedicto "Bencab" Cabrera, Arch. Lor Calma, Arch. Bong Recio and Ramon Orlina. While Arch. Paulo Alcazaren and Cid Reyes will serve as the Moderators. On Sept. 21, 2009 (Monday), a Live Art Sketching will pump the curious hands at 2-5 pm. Registration starts at 1pm. Interested artists need to bring their own art materials. Venue is the same as above. 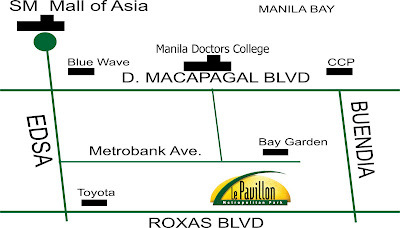 Please see the location map below. For more information, please contact (632) 898.8856 or 818.5656. Look for Pipo or Mark. Or email fcfernando@metrobank.com.ph or mmalvario@metrobank.com.ph.